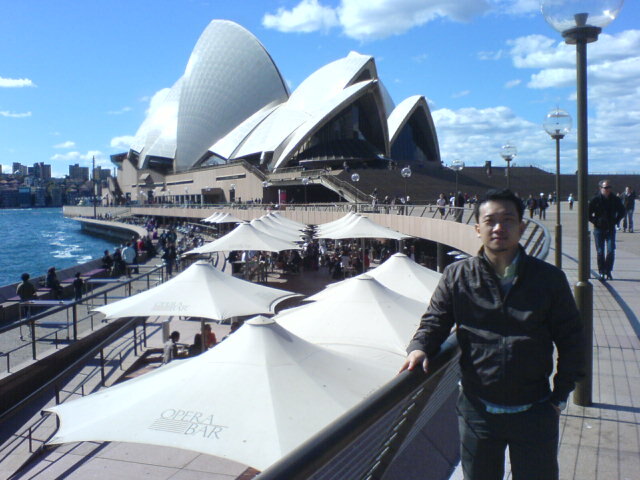 To make the story short, my Sydney trip is excellent and I love Sydney! End of story. Haha. Sorry, I'm just kidding. Hehe. How shall I start to express my feeling towards Sydney...I mean three words is all I need to describe everything: I love Sydney! 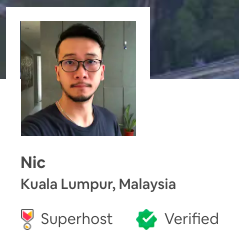 Let's skip the bad feeling we had faced during check-in in K.L. Central. 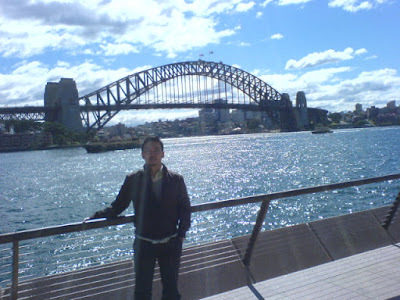 We took MAS flight to Sydney International Airport. It was an awful experience and couldn't sleep well during the flight for 7-8 hours. Poor my partner, he's so tall & 3 empty seats couldn't fit for him. When going back to Malaysia from Sydney, we had transit in Brisbane Airport. It was more suffering especially at night time when everybody is tend to sleeping mode. Thank god the 'nightmare' is over now. Hehe. Sydney is so wonderful that I fell in love at first sight. I never walked so much in my life in a city and couldn't bother to complain my back pain or tiredness. I just keep walking & looking around the people & building pass-by. Amazing I felt. Couldn't believe I actually there & walking towards QVB and soon Opera House & Harbor Bridge will be next. It was a working Friday. During the walk to Opera House, to be honest my eyes were vigorously looking at people more than building architecture. Haha. It's a white country after all. I always have good strange feeling with White people since kid. I was into Western tv shows & movies during my childhood. I admired those people who can live in Western countries like USA and UK. I always like snow, wanted to feel the snow falling from the sky. So naive. Haha. In Sydney, there are a lot of Asian. In ChinaTown, you will feel like you're in one of the street in Hong Kong. Haha. That's what they said, because I never been to HK. I just know they all Asian, and I don't feel like I'm in White country anymore. Hehe. So many immigrants in Sydney I realized by then. Finally saw the Opera House & Harbor Bridge. There were 50 step-cases up to Opera House I counted. The wind was so strong that could almost blown me away. No kidding you know. Mixed feeling I had struggled with coldness. I love cold though! We didn't go in Opera House. It was never in my mind at that moment. Looking at Harbor Bridge, Circular Quay & Sydney city view from Opera House Bay. Lovely city. I le it! It was even more amazed, the view from ferry we took to Manly. Harbor Bridge with sunset & view of Opera House in different angles. It just WoW! The friend took us to a few places in NSW. We went to Bondi beach, Newtown, Watson Bay, look up point and some places I don't remember the name. Bondi beach and Manly beach are wide countless sand beaches. The friend said the sand/beach can't be seen during Summer because it will be full of people in the beach. Cool. We went to Watson Bay to see a few things, things like Lady bay beach, the north cliff, far view of Sydney City and lighthouse. On that day we only could see naked men in Lady bay beach. I thought ladies only. Haha. Wonderful experience. we passed Paddington street, which full of all kind of cafes & people. Billy Kwong cafe is there. Billy Kwong is the father of Kylie Kwong, one of the food host on Asian Food Channel(AFN) of Astro. King street, which is another King st. that occupied over 100 Thai restaurants. along the street. We went to Citrus(King St, Church St, Newtown, Australia) to have cakes & drinks. Excellent. At that night, 2 other friends joined us for dinner. Lovely couple Paul & Jit. We dined at Spanish restaurant called Raquel's (98 Oxford Street, Sydney, NSW 2010 Australia). I liked the food there. To get a table, you have to be fast and make booking. It was crazy, a small unit of shop full of laughter & talk with all kind of people. We personally took a day-tour to Featherdale Wildlife Park & Blue Mountains. In this particular day, I finally saw Kangaroo and Koala in Featherdale Wildlife Park & 3 sisters in Blue Mountains. The kangaroo I saw from wildlife park isn't the biggest kangaroo in Australia. I did not get chance to hold Koala because it was placed on the stick-tree and eating grass. Here is the photo and video. 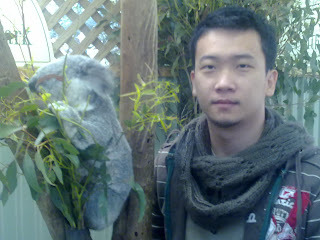 It seems very short trip but I've managed to see things that I must see in Australia which I did. What a wonderful trip. It gave me a lot of '1st time' experience in my life. Somehow I wish I don't want to go back to Malaysia. Haha. Sydney got everything I want. Love you Sydney.